Gourds up to 20 Inches Wide! 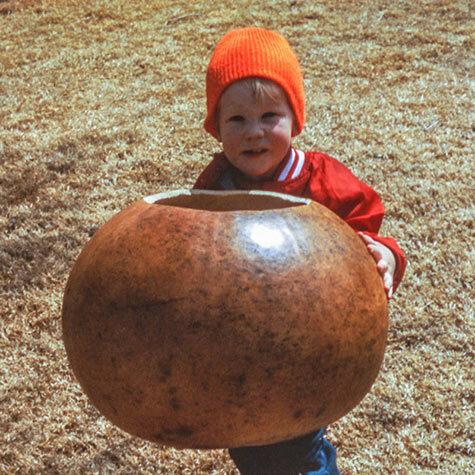 Produces extra-large gourds that are favorites for storage containers and crafts. Gourds grow an incredible 3-5 ft. around and weigh 25-60 lbs. Gourds should be harvested when the stem has dried and before the first killing frost. Once dried, these gourds can be washed, waxed and made into storage containers or decorated for crafts projects. In northern gardens, gourd seeds should be started indoors and transplanted to the garden after all danger of frost has passed. Each Bushel Gourd vine will bear 1-3 gourds. 110-120 DAYS. Comments: Start indoors in the North. Full sun and ample water. Weigh very little when dried. Can be dried for a large container.